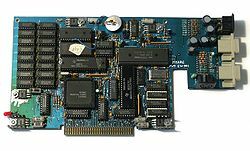 In 1987, Myarc - already known in the TI community for several peripheral expansion cards - launched the Geneve 9640, a complete computer on a card, intended to replace the original TI console. Originally, the name should refer to TI-99, but Myarc did not get the permission to create such a similar name. The single "9" shall keep a little bit of reference to the roots, the TI-99/4A. The new computer was designed to have a main memory of 640 KiB (main+video), comparable to the RAM size of common PCs at that time. 1At least for my system. Most important, the Geneve uses the TMS 9995 processor which is compatible to the TMS 9900 from the TI-99/4A, adding four more instructions. 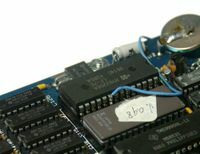 The video controller is a MSX 9938 which is also compatible to the TMS 9918 family. In order to increase compatibility, the Geneve offered a "GPL Mode" which reorganized the address layout to the TI-99/4A style. In that way, nearly all TI programs can run on the Geneve without any modification. Cartridges have to be copied to disk as the Geneve does not offer a cartridge slot. The Geneve has a built-in boot ROM, but this only provides a simple loader for a disk operating system, which, by some similarities to other known operating systems, was named MDOS (Myarc Disk Operating System). MDOS is currently still maintained and under ongoing development. The latest version is 6.50 and has been released as freely distributable. With this release, MDOS has been relabeled as Geneve OS. You can download a disk image for use in the MESS emulator. 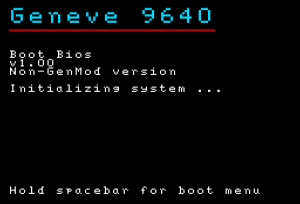 There has also been an update to the Geneve boot ROM which allows to choose the boot device. The original boot ROM could only boot from a floppy disk in drive one, or from a hard drive, but this hard drive must be addressed as HDS1. Other drives, especially SCSI drives, are not able to boot with the original ROM. Another popular extension is the CPU memory upgrade to 576 KiB. This modification is mandatory if MDOS 2.50 and above shall be used. The multi-layered printed board layout makes such modifications pretty difficult (if possible at all), but in this case it is only required to solder another SRAM piggy-back onto the existing RAM circuit. One of the select lines must be connected to the Gate array. Here are the detailed instructions. Full usage of 2 MiB address space. Zero wait state for external memory. This requires a set of modifications to the Geneve board. As the circuit board of the Geneve extends outside of the Peripheral Extension Box, there is some chance that the box slot gets in contact with the board, causing a short circuit. It is a very good idea to protect the portion of the circuit card that extends outside the PEB with electrical tape to shield it from possible damage by the fingers to either side of the PEB slots. Earlier products from Myarc suffered from stability problems. There was not much confidence that this should have changed for this complex new project. Myarc decided for a high integration on the circuit board which required multi-layer boards. 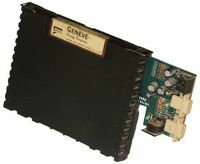 As a pretty large part of the community is dedicated to hardware projects on the TI, the new Geneve makes modifications hard or even impossible. Not only the hardware but specifically the implementation of DSRs showed that Myarc programmers did not pay enough attention to standards within the TI architecture. For example, instead of using the standard way of inspecting the peripheral card DSRs for devices, the Myarc DOS for the Geneve included these devices in the code, leaving no way to include new peripherals anymore. 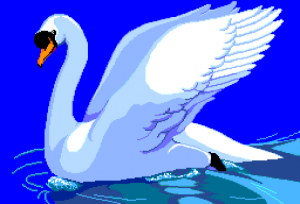 Therefore, the acceptance of the Geneve depends much on the area of interest of the user: While hardware-related projects mostly keep away from the new computer, software authors welcomed the new features, and quite a lot of programs have been written. The Myarc DOS (MDOS) is still developing. This page was last modified on 14 September 2015, at 17:04.